Jody Hice led the crowded field of Republican candidates for the 10th District seat in the U.S. House of Representatives being left vacant by Broun. Hice had 31.9 percent of the votes, followed by 25.2 percent for Mike Collins. 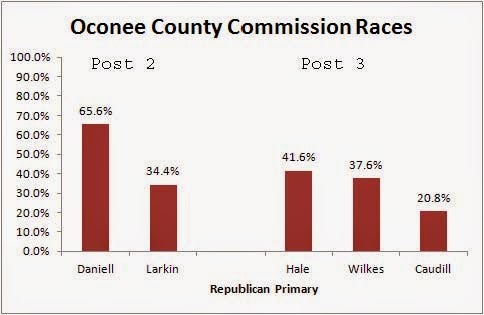 Oconee County Democratic voters overwhelmingly supported Michelle Nunn (89.3 percent) in the U.S. Senate race, and Republicans overwhelmingly supported incumbent Nathan Deal (73.7 percent) in the Republican governor’s race. The Board of Commissioners races were the only contested ones locally. John Daniell received 65.6 percent of the vote in the race for the Republican Party nomination for Post 2. John Larkin received 34.4 percent. Hale received 41.6 percent of the votes cast in the Republican Primary for Post 3. Wilkes received 37.6 percent. Maria Caudill received 20.8 percent. A majority of those voting in the Republican primary (52.0 percent) said they did not support changing the district lines for the 117th District and 119th District in the Georgia House of Representatives to bring Oconee County back into a single district. The Democratic Party did not have any candidates on the ballot for the BOC races, meaning the Republican candidates likely will be unchallenged in November. Results are unofficial but include all but a handful of provisional ballots, that is, ballots not yet accepted as valid, and late returning military ballots. A total of 5,147 (23.4 percent) of the county’s 21,964 registered voters turned out today or in the two weeks of early voting. Republican ballots accounted for 88.9 percent of those cast in the county.